Our floral experts have designed a bouquet sure to bring a smile to anyone's face! 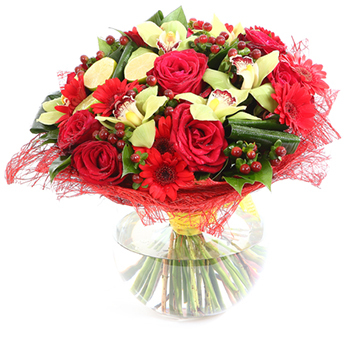 Remarkable roses in red shades along with red gerberas peek out between striking Asiatic lilies in all blooming from a cloud of opaque red ribbon. Welcome them to their new home, tell them to Get Well Soon, or just let a friend know you care with the Heart Full of Happiness Bouquet.